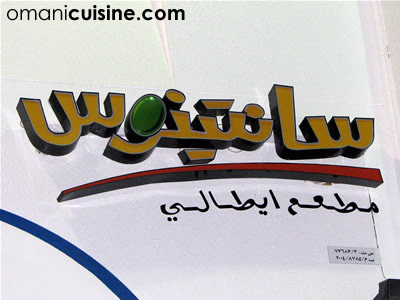 Santino’s Bistro Italiano is an Italian restaurant located in Jawharat Al Shatti mall in Shatti Al Qurum. This is not a fast food take away outlet like the one found in the Food Court of City Centre (which I’ve never tried), but a dine-in restaurant. Santino’s is one my personal favourites in town, love their food, the staff are all Asian and are generally very friendly, but the place is relatively small and could get quite packed at peak hours, also there isn’t a toilet in the restaurant. 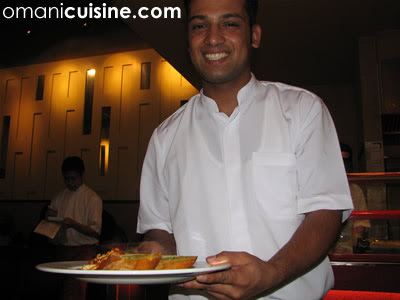 During my first visits to Santino’s we always had a problem with the starters, while they are good, they’re as big in quantity as some main courses in other places. The waiter’s were not very helpful in this department as we were never advised on how much we should order. 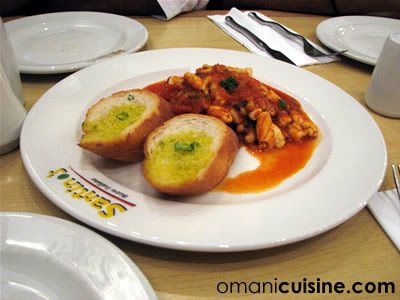 They have a couple of really good calamari starters, my favourite is the Calamari Piccosi, a spicy calamari and beans dish served with two garlic breads. We share this among two. 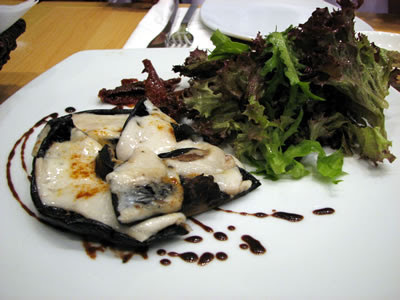 There are loads of different starters, unfortunately I did not take a copy of the menu and I cannot recall the Italian names of the dishes. 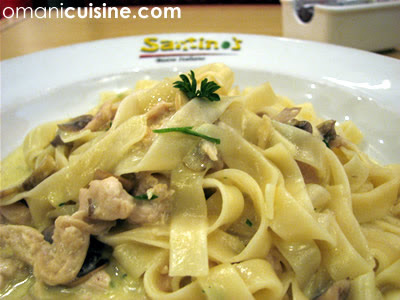 There are five different main course types in Santino’s: salads, rice meals, sandwiches, pizzas and pasta dishes. I never tried the salads or the rice meals, so I cannot tell you much about these two. 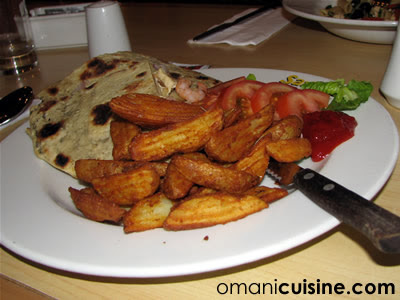 Sandwiches at Santinos are served in very thick pizza-like bread, along with potato wedges and salad. You can select up to four fillings for your sandwich from a collection of 15 or so fillings. I only had this once long time ago and though it tasted good, but it was very messy and quite hard to eat because of the hard bread. Pizzas at Santino’s are what I usually order, there are again a variety of beef, chicken, sea food, and vegetarian pizzas made on a thin base, the ones I remember having are Mia (chicken, pepper and mushrooms – I think), Margherita (cheese and tomato sauce), and Santino’s Special (beef, pepperoni, chicken, pepper, and loads of other stuff). All of which I recommend. 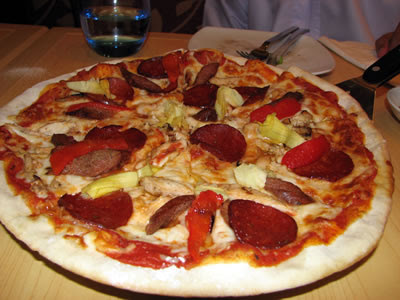 Santino’s Pizza’s come in a standard size and a larger one to share among a group. 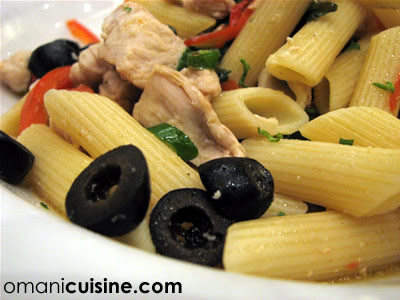 I recently tried having pasta at Santino’s and had a Penne Santino’s (pictured above), a rich chicken pasta with olives, red pepper, and spinach – which was good, but not as memorable as the other meals I had here. I am generally not a pasta person, that might explain. One of my friends had a Tagliatella Alfredo (pictured below), which he thought was good. As usual, nobody experimented with their drinks and had only Mountain Dew, that is a habit I think we should stop. I previously tried their chocolate cake which was more like a chocolate mousse rather than a cake, but which we still enjoyed nonetheless. 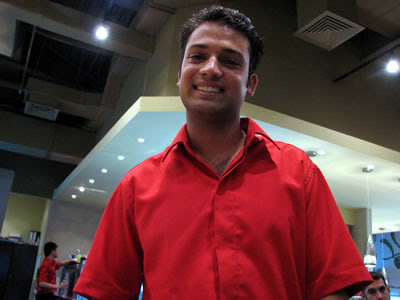 Starters are Santino’s cost around RO 2, a main course about RO 3. 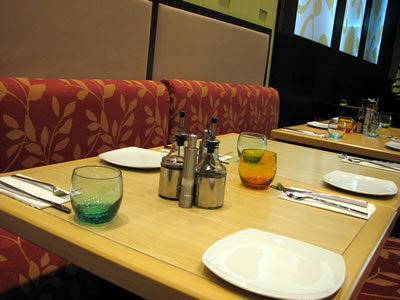 A dinner for three (2 starters, 3 main courses, and 3 drinks) cost us around RO 15 – taxes included. Santino’s is one of the of nicer little places in town, great food and good service. 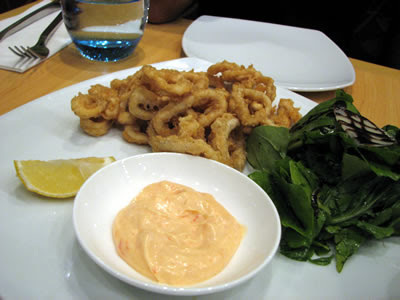 Anybody going there has to try to the Calamari Picossi!